Especially popular in decorating the interior for more than a dozen years, use bead products, and especially trees made by themselves. Often, among the variety of such crafts, you can see directly works of art. Original trees, made of small beads, cause interest not only among experienced craftsmen, but also in beginner needlewomen. And not without reason, because this process is really amusing and fascinating! For those who just decided to start weaving a bead tree and do not know the basics of beading, we suggest using step-by-step instructions for the manufacture of basic elements. First you need to prepare the necessary beads . On sale there is a huge amount of this material (round, oblong, square, triangular Czech beads Preciosa, bugles, drops, rocailles, rivoli). In any specialized store the seller will be happy to help you in choosing the right bead for weaving wood. We also need a thin flexible wire . It can be steel or golden in color, but you can also find colorful (green, red, white). Prepare small pieces of floristic paper (in order to hide the wire on the trunk). If there is no opportunity to purchase it, you can use the usual dense colored thread. For work, some additional tools will also be required: round nose pliers and wire cutters, scissors, tweezers. To strengthen the base, you need alabaster (gypsum), stone or decorative plate. For the convenience of work, the beads are best scattered in small boxes. Weaving is best done on a non-slip surface – on the table you need to lay a tablecloth or linen napkin. All elements in beading are braided in accordance with special schemes. For those who are just beginning to master this technique of making hand-made articles, it is recommended to choose an easier way of working. We string 3 beads on the wire. One of them is placed upwards, through the other two crosswise we cross the ends of the wire. Further on one of the ends we string 3 beads and pass the second end of the wire from the opposite side. We tighten the ends, so that the rows of beads fit tightly to each other. Each new row is increased (reduced) by 1 bead to the required dimensions of the work piece. The ends of the remaining wires are tightly wound into a spiral. Thus, we get 1 leaflet-stock. For weaving a small tree, we need a few dozen of these blanks. Another of the simplest ways of weaving twigs is twisting . On a wire of the necessary length we string the beads, we get an ordinary chain. Then we retreat a few cm from the edge of the wire, count 3 beads (you can and more, depending on the size of the leaf) and do twist (twist several times). Then repeat the twisting approximately in 0.5 cm to the required length of the twig-billet. The remaining free end of the wire is twisted twig. Now that you have mastered the basic methods of weaving, you can proceed directly to work. From the strung beads we form loops on 5 pieces in each. We leave the middle loop, and the rest we twist into one flagellum. We combine the resulting flagella into several pieces into branches. The ends of the wire are stretched, leveled and tightly wound with a thread. From several branches collect the trunk. Similarly, make the barrel blue. The ends are cut, we fix the threads with the help of glue. We fix it in the prepared form (for stability it is best to gypsum or strengthen it with clay or plasticine). The base can be decorated with rhinestones, sparkles or covered with mother of pearl lacquer. increasing to 11 pieces in the loop). In total, about 15 such bunches will be needed. We will weave greens, using round beads and bugles. We twist individual loops-leaves reducing the number of round beads. The leaves, as we see, are obtained in an elongated shape. Each branch consists of tightly twisted pyramid-shaped inflorescences and 2-3 branches of greenery. We collect the tree from individual blanks. We wrap the barrel and thick branches with floral fabric or tape on fabric basis. In the ceramic pot, pour a solution of alabaster (gypsum), place the tree trunk. After the solution has dried, it will become hard, decorate below with decorative pebbles or seashells. This tree is distinguished by its tenderness and grace. To make cherry blossoms (Japanese cherry blossoms) you should stock yourself with beads of gentle pink color. A souvenir made of mother of pearl beads will look very beautiful. Pre-formed from a thick wire trunk reinforce in the form-base. After the pouring hardens, the trunk is covered with a dark brown paint, the imitation of the soil is made of green beads (so that they do not fall off can be glued with PVA glue, glue gun or top to cover with a colorless varnish). Now we make foliage (each small twig consists of 13 leaflets). We collect fluffy branches. The ends of a thin wire are fastened each of the collected flower branches to the base, wrapped in thin strips of paper napkins, impregnated with a solution of water and PVA glue (1: 1), after complete drying we cover with paint. The spring tree, symbolizing growth and prosperity, is ready! You only need to carefully spread out the leaves and put it in a prominent place, so that everyone can admire this beauty. Weaving of mountain ash is similar to the above options. It differs only in the structure of leaves and the presence of bunches of berries. The photo shows schematically the principle of weaving details. It should be noted that the beads for berries are better to take a larger size than for the leaves. The tree will look great in the winter on the windowsill. To remind about summer adventures and spent vacation on the sea coast, there will undoubtedly be a symbol of summer – a tropical palm tree. The individual blanks for weaving this tree resemble sprawling branches. Pay attention to the trunk – it is straight, without additional branches. Decorate the composition is recommended small shells glued with a glue gun. One of the most pleasant and desirable gifts, undoubtedly, will be the money tree. 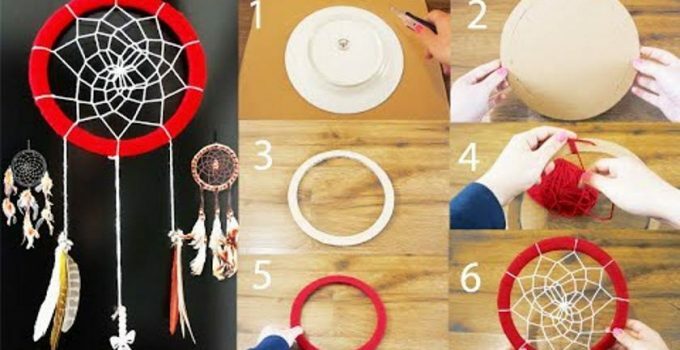 It is not so difficult to make it – it will be enough to master the basics of beading and stock up an odd number of decorative coins (you can use Chinese souvenir coins). Money is weaved together with beads in the process of work. If there is no opportunity to purchase special coins, then you can use these. Strengthen them with a special super-glue. Now you yourself can “grow” your personal home talisman of wealth and abundance. 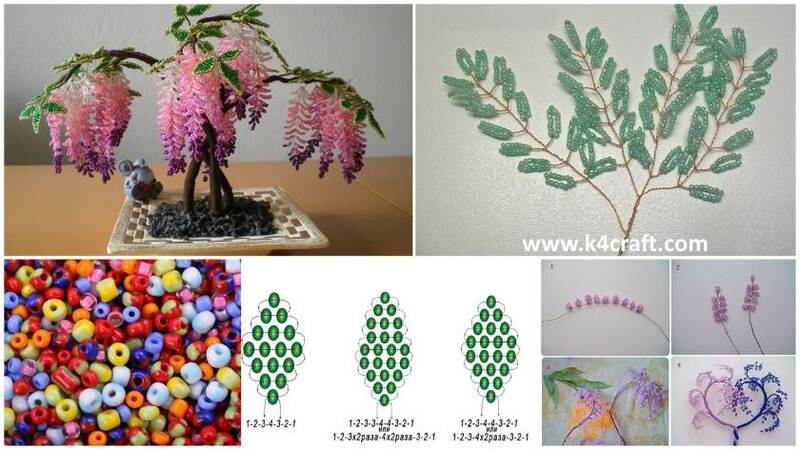 On the Internet you can find various samples of ready-made souvenir trees from beads. But now, owning the technique of weaving, you can “plant” your beaded garden. Inspiration and imagination in your work!